if you bought a cheap adapter from any Chinese trade so please check that meets specifications. Some of these cards have a bad budget proposal and thus in the ports which are reported as PCIe card. Please check the pin 43. If it is connected to the ground and just interrupt this path. Check if you have NAS option checked in Foris (drivers for ata). Then check what you have in kernel log (dmesg) just after boot. Look for lines containing ata. 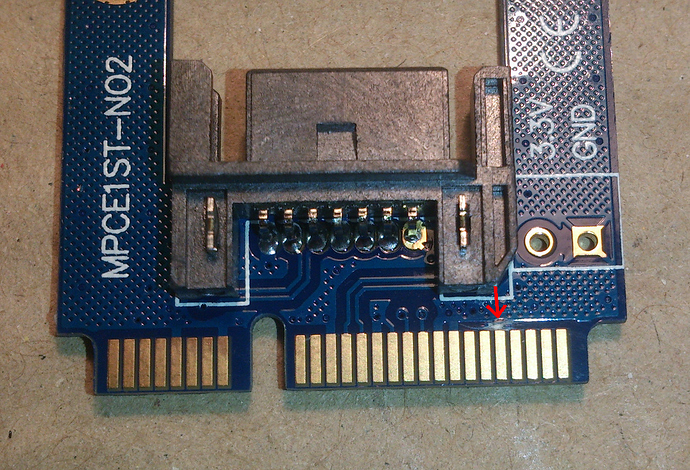 then try to put some tape on pin 43. Tried to disconnect pin 43 with sticky tape. Does not work… Edit: kernel modules were missing… I had nas option unselected so sata modules were uninstalled. You have to install: * kmod-ata-marvell-sata * kmod-ata-mvebu-ahci And then when you cut off (or put sticky tape on) pin 43 - it should work. Thanks, I got the same card, and after i fixed the cars in a simelar way as you did it works, Turris has found the drive now!